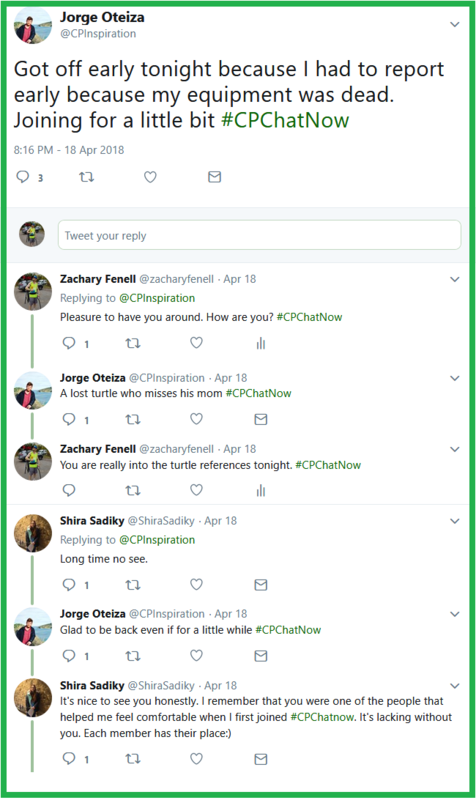 #CPChatNow’s communal atmosphere remained on full display Wednesday, April 18th, 2018 during the weekly Twitter chat. Familiar faces returning after lengthy absences helped to establish the night’s tone. Here to tell you all about the evening, I am co-host Zachary Fenell. Those aforementioned familiar faces referenced included long-time participant Hannah Pike and always busy co-host Jorge Oteiza. Other participants warmly greeted the two. Co-host Devin utilized a wrestling GIF to welcome Hannah and Jorge. Such a GIF demonstrates another aspect to our friendly community. Perhaps an element to discuss in a future recap! For now, let us catch up with Hannah and Jorge. Some serious health issues kept Hannah away from #CPChatNow. Issues she recently detailed while blogging. Thankfully the reasoning behind Jorge’s absence involves a lot less dire circumstances. College and work continues to keep him pre-occupied. As Jorge explained, an earlier shift allowed him to make the week’s chat. Just like Hannah, participants excitedly met Jorge. 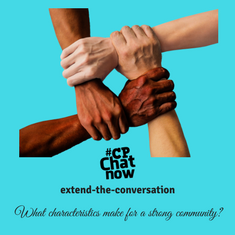 Specifically, Shira Sadiky recounted how Jorge helped her feel comfortable when she first joined #CPChatNow a couple years ago. Comfort definitely stands important towards building a strong community. What other characteristics do you also find valuable in a community? Answer for the week’s extend-the-conversation question, “What characteristics make for a strong community?” Respond in the “Comments” section. 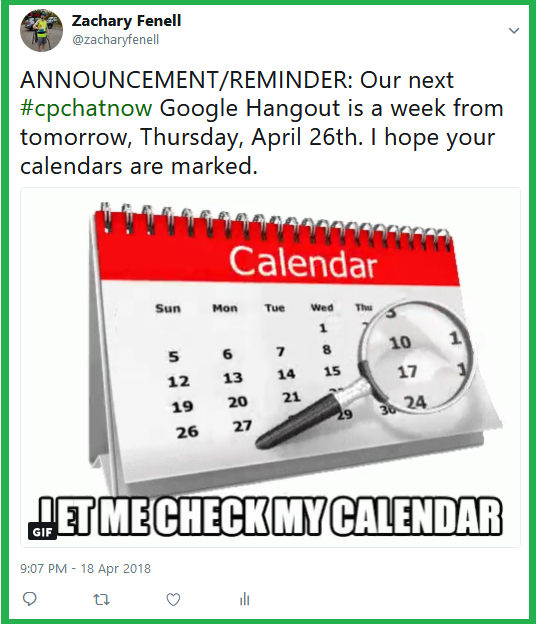 Maintaining the communal theme, remember #CPChatNow’s forthcoming April 2018 Google Hangout. The monthly Hangout allows our community to chat using a more open platform. No character limits! Plus video chatting adds communication factors like tone of voice and facial expressions, enhancing the dialogue! Due to privacy reasons, the link to the Hangout does not go out publicly. Perchance you want to join us, message the #CPChatNow Facebook fan page to let us know. Before visiting our Facebook page though, answer the week’s extend-the-conversation question! “What characteristics make for a strong community?” Answer by commenting below! I eagerly await seeing your replies. 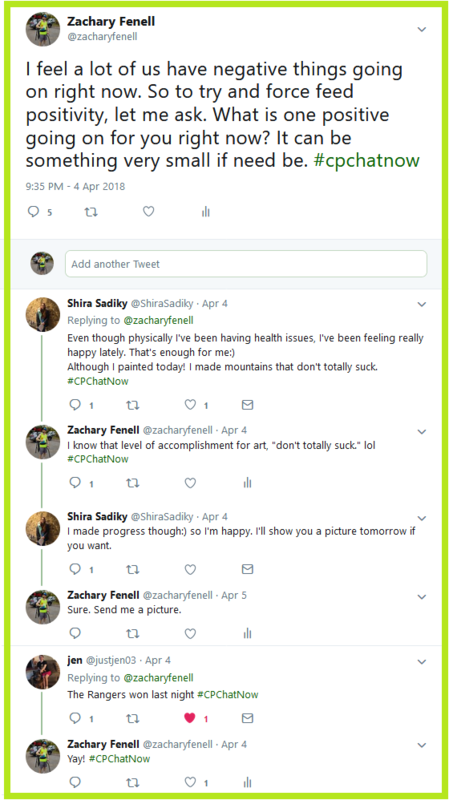 This past week in #CPChatNow was busy as always. Members talked about birthdays, lost family members, and writing books. This is #CPChatNow Co-Host, Devin Axtman, taking you along for this week’s recap. This bring us to our Extend-The-Conversation Question: If you wrote a book about your life, what would be your topic? Please share your answers in the comments! 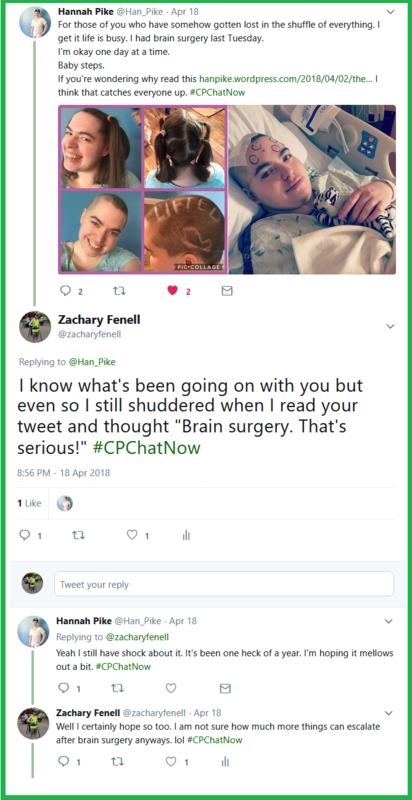 Assorted subjects came and went during the live cerebral palsy Twitter chat #CPChatNow Wednesday, April 4th, 2018. I am co-host Zachary Fenell here to play reporter and give you your weekly recap. A challenge given the various topics discussed! Early on the chatter contained a downer tone. Participants shared difficult life situations they currently face. Looking to turn the dialogue upbeat, I asked about positive happenings, no matter how small! My co-host Devin also enjoyed the article. He and I noted what resonated with our respective selves. Devin liked how Carlos seemed “like he’s one of the guys.” Personally, the coach working with Carlos’ psychologist and physical therapist impressed me. 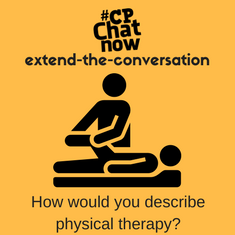 Speaking about physical therapists, physical therapy arose as a conversation generator. 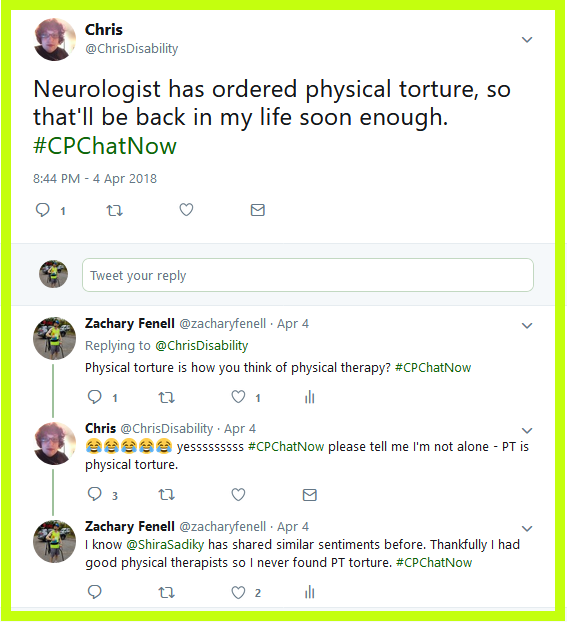 Chat regular Chris made mention her neurologist ordered “physical torture.” Physical torture meaning physical therapy (PT). I recalled other participants vocalizing similar sentiments towards PT in past chats. Want to add in your opinion? You can by answering this week’s extend-the-conversation question. “How would you describe physical therapy?” Leave your response in the “Comments” section. Also worth mentioning from our chat Wednesday, April 4th, we announced the date for our April 2018 Google Hangout. If you like joining the monthly video chat, mark your calendars for Thursday, April 26th. To maintain a safe environment, we do not send out the Hangout link publicly. To get added to the invite list, contact Devin or myself. Before reaching out though, remember to answer the week’s extend-the-conversation question. #CPChatNow was especially fantastic last week! Longtime member, Rachel Folly, led a focus chat on the past year in members’ lives and developments for adults with CP. Jen mentioned that she experiences pain, but sometimes feels guilty because it is moderate. Rachel tweeted that everyone’s CP is unique. The next question revolved around what members saw in the media about adults with CP in the past year and how it impacted them. Members largely answered with the story of an adult with CP being assaulted at a gas station. 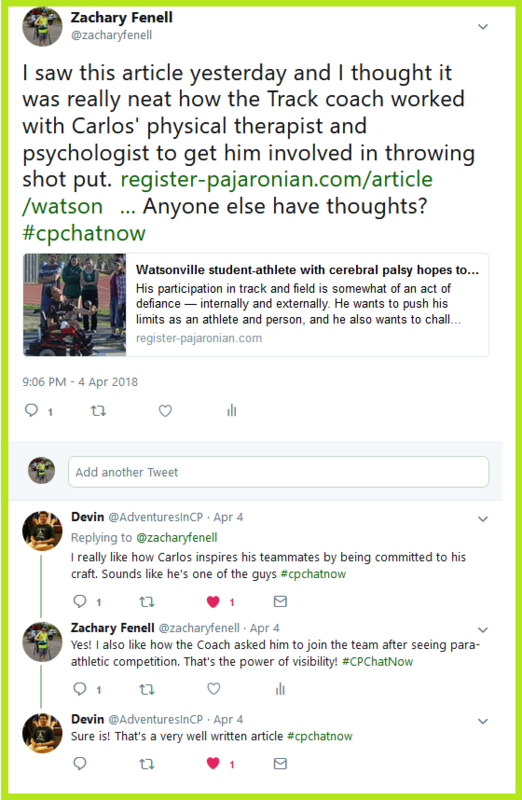 Additionally stories mentioning Zach and another person with CP completing a marathon arose. Linds tweeted about wanting to continue to educate others that people with CP are first and foremost human, like anyone else. This brings us to our extend-the-conversation question. As we move past CP Awareness Month, what are your goals for the upcoming year in regards to CP? Please share your answers in the comments! Thanks for following along and tweet you later!